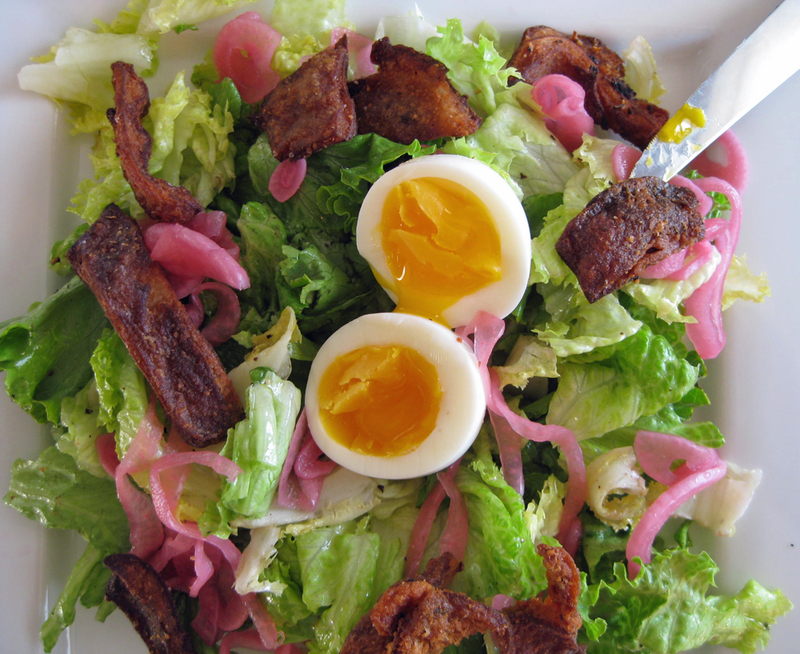 Crunchy pig's ear and egg salad. There’s a cold braised pig’s ear in our fridge. As you know from our last post, we butchered a pig, a whole pig, and now we’re eating the bits we brought home from the class. We froze all 55 lbs of the meat and have been eating the parts that should have been consumed fresh first. So one of the frozen bags was labeled shoulder and face. And what do we get when we pull it out of the freezer the other day? A huge ear! That ear sat in the fridge defrosting for a few days while we avoided the inevitable. The butchering class didn’t freak us out so much but having a pig’s ear in the fridge is sort of weird. It’s not that we’re being overly squeamish it’s just that it’s a freakin’ big ear and we’ve never prepared a pig’s ear before or any animal’s ear for that matter. 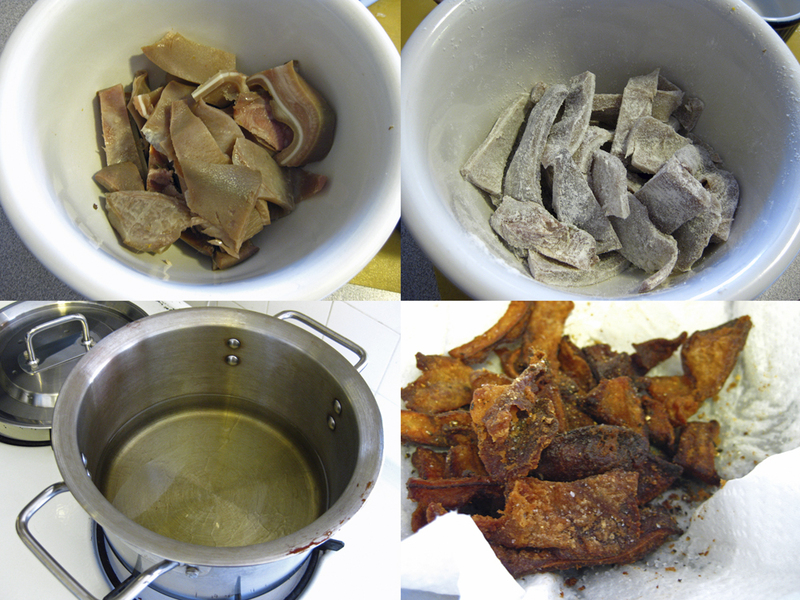 The recipes we found on-line and in Bruce Aidell’s Complete Book of Pork all say how delicious pig ear is. Even while watching an episode about food in Spain on Gourmet’s Diary of a Foodie, which we watched in preparation of our trip in August, they featured pig’s ear as a rustic, mouth-watering, delicacy. We’re big fans of all things porcine and we were sure the ear was going to be just as tasty as, say, bacon, but we still had to come to terms with the ear before we could move on to the cooking of it. Jason: I didn’t have any trouble poaching the ear. Although I really didn’t want to touch or pose it for any photos. We’ve showed enough gruesome images in the last post. The problem I’m having with the ear is more about what it represents than what it is. Whenever I think about it I become conscious of my own ears. I get a warm tingling sensation in my ears and then there’s a tightening in my chest and I think to myself that I’m forgetting to breathe, so I remind myself to breathe, and I take a deep breath. Steve: I didn’t think anything of the ear until it was sitting there in the fridge, braised, chilled and ready for frying. We’ve seen pig ear on menus presented fried with a nice frisée salad. We watched a couple of videos of cooks frying pig ears and it looked like a lot of work. Deep-frying that ear was the last thing I wanted to do when I got home from work, but it had to be done and it was time for me to take my turn with the ear. Jason: Alright, put on an apron and man up to the ear. Grab the knife and chop the cold ear up. It’s time to fry up some ear. I couldn’t do it. I gave the butchering job to Steve for the night. I just couldn’t bring myself to chopping it up. I kept thinking of Vincent van Gogh and the whole ear thing. Steve: First things first: trim the ears of any excess skin and meat at the base where it connected to the head. Then, lay it out flat and cut into half-inch strips. The strips are then tossed in a little flour and corn starch before going into oil heated to 375 degrees. I hate this part. We don’t have a proper deep fryer and the splatter of all that super hot oil freaks me out and I tend to start jumping around the kitchen like a nervous rabbit when whatever we’re frying hits that hot oil. The ear was no exception. They have a lot of water in them and it pops and spits in the bubbling oil. This kind of frying requires swim goggles and a splatter screen to avoid serious bodily harm (Jason thinks I’m nuts). Jason: Frying doesn’t freak me out as much as Steve. I’m used to little burns and bubbling oil from my days working in professional kitchen. It’s just the smell and mess it makes that irks me. Some things, however, are worth the effort. This is one of those things. Once we figured out the oil temperature and browning stuff, things moved quickly. We drained the crispy brown pieces on paper towels and sprinkled them with sea salt. Both their texture and flavor were perfect! We ate them over a lightly dressed salad of green leaf lettuce along with some thinly sliced pickled red onion. A soft-boiled egg nestled on top completes the dish. Heat about 3-4 cups canola oil in a medium sized stock pot until the temperature reaches 375 degrees. The oil should be about 2 – 3 inches high along the pot. In the meantime, cut up the pig’s ear (Steve, describe a bit more here). Toss with flour and cornstarch. When the oil is up to 375 degrees, add a few ear parts at a time. Be careful the oil will splatter around. Cook for 2-3 minutes and dark brown. Remove from the pot and transfer to a plate with paper towels or a paper bag. Using a mandoline, thinly slice the red onion. Add a non-reactive bowl and cover with your favorite vinegar. Refrigerate for at least 2 hours or up to several days. Enjoy on tacos, salads, sandwiches, or with cheese and crackers. Fill a small saucepan 2/3 full of water and bring to a simmer over medium heat. Prick the round end of each egg with a sharp tack. When the water is simmering gently add them and reduce the heat to low. Cook the eggs on a gentle simmer for 7-9 minutes, depending on how runny you like your eggs. Pour the hot water off and add cold water for 30 seconds to 1 minute. Crack the eggs and peel. If the egg is difficult to peel place under running water. Gently pat dry before serving. Add 1 part vinegar to 2 parts olive oil with a small dab of Dijon mustard and salt and pepper to the bottom of your salad bowl. Whisk until smooth and taste with a clean, dried lettuce leaf. Adjust seasoning per taste. Place lettuce in the bowl and toss. As we were making up our recipes for the involtini we found that a lot of them called for spinach. We wanted to make the most of the ingredients we had on hand and we still had a bunch of collard greens from our CSA box, a fitting, if not obvious, substitute for fresh spinach. Most people think that collard greens need to be cooked for hours in a pot of water with a lot of smoked pork, but eating the greens raw, or just blanched, is a wonderful way to enjoy the big flavors of this hearty green. The filling, a Mediterranean-inspired mix of feta, raisins, pine nuts, and bacon, comes together with sweet salty crunchy goodness. Fry the bacon in a small sauté pan over low-medium heat until crisp. Remove the bacon and set aside to cool, once cool, crumble into small bits. In a small bowl combine bacon, feta cheese and pine nuts, season with salt and pepper. Set aside. Add water to a skillet filling it half-way up. Heat the water to a simmer and blanch the collard greens for 30 seconds to two minutes, or until the leaves are pliable. Dry on a clean towel. Carefully butterfly the chicken breasts by cutting through the center of each as if you were opening a book. Do not cut all the way through. Open the breast and place between two sheets of plastic wrap. Using the flat end of a meat tenderizer or the flat bottom of a small sauté pan, gently, but firmly, pound the chicken breast between the plastic making sure to pull the mallet or pan away from the center of the breast toward the edges of the cutlet. Pound each breast until about ¼ to 1/8 inch thick. Season the inner part of the breast with salt and pepper. Place two leaves on each breast and divide the filling between the two. Spread the filling evenly over each breast, leaving about ¼ inch on each side. Roll each breast starting with the thin end first, being careful that the filling does not fall out. If needed, secure the breasts with toothpicks to keep the filling in. Heat olive oil in a skillet over medium heat until hot. Add the chicken breast to the pan, presentation side down, and cook for 3-4 minutes. Be sure not to move the chicken breast until it releases from the pan on its own. Turn and sear on remaining three sides, each about 3-4 minutes. Place in the oven for approximately 10 minutes or until an instant read thermometer inserted into the center of the involtini reads 160 degrees Fahrenheit. Fry the involtini in a lot of oil to keep from sticking to the pan. Remove involtini from the oven and transfer to a plate. If any cheese has dropped on to the skillet remove it. Place the skillet over medium heat, add the shallot and sauté for a couple of minutes or until translucent. Add the vermouth and scrap the bottom of the pan to get all the good bits from the bottom. Cook until almost evaporated then add the chicken stock and reduce by half, about 5 minutes. Off heat, whisk in the soft butter, and season with salt and pepper. Slice involtini into one-inch thick rounds and serve with pan sauce.